Synopsis: Illegal immigrant comes to America and tries to find his place in this country but his past comes back to haunt him. To preface the review, it feels necessary explain a bit about my history with Superman as the character. It might be my particular bias towards Batman and other heroes that lend themselves to more interesting story lines, but I've always found Superman boring. An all-American, boy-scout type of character who has super human strength, speed, laser eyes, and freezing breath has very few mortal enemies. In the majority of the stories that made Superman interesting were stories that tested his morality not his strength and powers. So when the trailers for the new movie came out, it actually piqued my interest. And I have to say that despite quite a few problems, this is my personal favorite summer blockbuster of this year. Director Zack Snyder has a tendency to inspire nerd-rage all around, whether it's him all-too-faithfully adapting WATCHMEN, or with that stupid mashup of a movie, SUCKER PUNCH, angry blog posts and comments follow the man around. But here, he is both stretching a few of his directorial muscles while still making this feel like a Snyder movie which deserves to be commended. The structure of the story through flashbacks was actually a really great way to tell his backstory. There are some obvious parallels to BATMAN BEGINS where we see a "realistic" depiction of how a superhero comes to terms with his powers. Not sure just how much this has been talked about, but the shots of young Clark Kent trying to deal with his new found powers were nothing short of beautiful. Unfortunately, a lot of the shots were already shown in the trailer, but within the context of the movie they still look great even if they have that very obvious Terrence Malick influence. Of course, there are a few issues with the movie. The movie's dialogue is a little clumsy. You'd think that given the producers', Christopher Nolan and David Goyer, involvement that they wouldn't have had characters blatantly explaining plot points or asking clarifying questions in between the action scenes. The camera work in the movie was too frantic during the action scenes. The camera could not sit still for more than .000001 seconds and the CGI work got to be a little weird and overwhelming at times. Snyder is known to film just with a green screen, but adding a few more of the actors to the shots would've helped make the fights a little less....cartoony. Think of an attempt to make a Dragon Ball Z movie, and you get the picture. Performance-wise, Henry Cavill has to be one of the best actors to play the iconic Kryptonian. Sure, he was a little serious, but he brought a lot of emotion to the part when it actually called for it. Amy Adams has to be such a cool version of Lois Lane. She's a no-nonsense lady who was clever enough to track down the "mystery man" that is Clark Kent and takes a more active role in the story rather than just sitting on the sidelines. And yes, Michael Shannon is great as General Zod. I have not seen the original movie where Zod appears, but this is another great entry into the line of villains that actually has a better motivation than just, "I want to rule the universe." Thematically, fatherhood and one's destiny are the main ones that the movie explores. 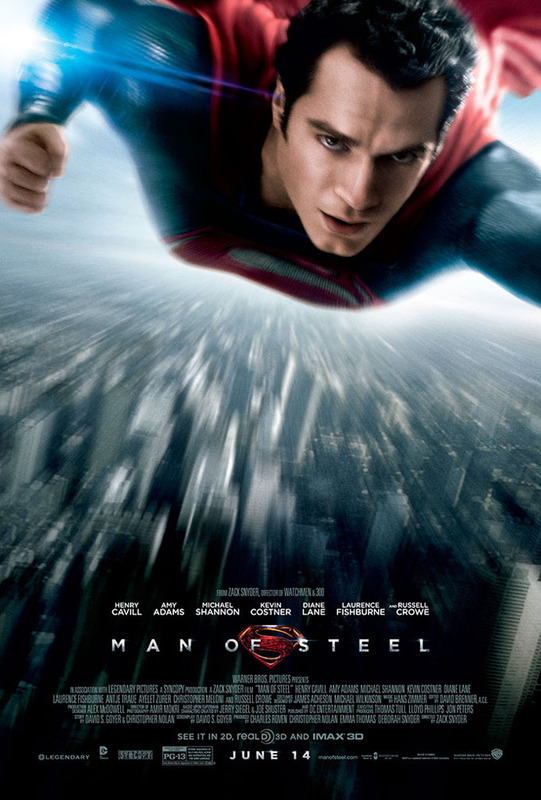 While destiny and morals are intertwined with the fatherhood, they weren't handled nearly as well, especially through the actions of Superman in the last third of the movie. Now, Russell Crowe as Jor-El and Kevin Costner as Pa Kent, both of these men in one way or the other are trying to shape Kal/Clark to be something better and understand that his powers and his heritage are not something to be misused or treated lightly. The fact that a 12 year-old can lift a bust out of a river is a huge deal, and the fact that he has to make a decision as to how he wants to use his powers is an interesting one. Finally, the third act battle scene is something that I want to touch on regarding the way that it impacts our view of the character. The battle takes place in Metropolis with Zod and Superman battling each other, and in the process, destroying millions of dollars worth of property and buildings and presumably the people inside and around the buildings. You can only assume this was some sort of strange carelessness on the rather new superhero as to why he didn't leave the city to a more secluded area to fight Zod. Mind you, it is completely understandable that people are disturbed or upset by this. But it does make one wonder why this movie is so harshly criticized for this blatant destruction and "9/11" imagery, while the AVENGERS gets a pass for destroying New York City buildings with flying alien vessels. Obviously there's more to discuss about this issue but that'll be for a later post. Regardless of the controversy, MAN OF STEEL is a reimagining of the character who has been rather stagnant in the last few years. There's a bigger emotional punch to the struggle of Clark trying to make sense of his powers, heritage, and place in the world. It is building a new type of world and possibility a new continuity and better direction for the character.